Who might run for Egypt’s 2018 presidential elections? Next year’s elections were recently brought to the forefront after prominent political activist and former presidential candidate Hamdeen Sabahy called for all political factions to unite and choose a candidate for the upcoming presidential elections. In this report, Egypt Independent highlights the politicians and public figures who have openly declared, or hinted, that they might run in next year’s elections. Sabahy ran in 2012 presidential elections directly following the 25 January revolution, and was also current-President Abdel Fattah al-Sisi’s main competitor in the 2014 elections, describing the current regime as a “risk” that threats Egypt. He spoke at a conference attended by Egypt’s prominent leftist political parties. It was decided that the parties would unite to prepare and plan for the 2018 presidential elections. This union of leftist political factions and Sabahy’s call for all parties to agree on one presidential candidate, raised questions in the political arena as to the shape of 2018 presidential elections and its candidates. Prominent political figures and former candidates from all ends of the spectrum have indicated, some clearly and some subtly, their intentions to run for the upcoming elections. Sisi has clarified multiple times, most recently at the state-sponsored National Youth Conference, that he will only run if the Egyptian people want him as president again. “I will not stay in power for a second presidential term if the Egyptian people want me to leave; I swear that if the Egyptian people do not want me, I will not stay in power for one second,” the president said in response to a question at the conference. Sisi’s popularity may be under threat due to several economic reforms and austerity measures he passed, including the flotation of the national currency which lead to unprecedented price hikes and a lower standard of living. This has opened the door for other ambitious politicians to possibly run in what may be their best chance of winning the presidency from Sisi under the currently unsatisfactory economic conditions. He first appeared as a candidate in the 2012 elections. Moneim has a partial affiliation to the now-outlawed Muslims Brotherhood (MB) group; however, he promoted a different strategy and ideology to that of the Islamist group. In an interview with Turkish news agency Anadolul, he said he would run in the upcoming elections against Sisi, as long as the elections are fair and not fraudulent. As for competing with Sisi, Moneim said the president’s current performance is enough to topple him from power, especially as his administration has faltered when it comes to improving the economy. Khalid Ali, 44, is a prominent lawyer who ran for the presidency in 2012. His reputation is on the up owing to his work in asserting Egypt’s sovereignty over the disputed Red Sea islands in the country’s supreme courts. His popularity following this successful verdict has increased his chances of becoming a candidate in 2018. In a recent interview with AP, Ali said he is a “potential” presidential candidate. Despite his call for a sole candidate, his chances for running are on the rise. Prominent pro-government TV anchor Lamis al-Hadidi asked him to run for the presidency on her talk show, saying that he is considered an important politician among Egyptians. Geneina dominated the headlines in 2016 after he made statements about the excessive volume of administrative corruption in the government. The former head of the state-run Central Auditing Organisation (CAO) said wasted public funds amounted to EGP 600bn from 2015; these statements were then invalidated by a state fact-finding committee report. Sisi then dismissed Geneina in accordance with a presidential decree he issued in July 2015 giving himself the authority to appoint, replace, or dismiss heads of regulatory bodies. The possibility of Geneina running for president has proved popular among the media, but, until recently, the former auditor clearly stated that he hadn’t made a final decision on the matter. Some have speculated that he may not be eligible to run as his wife is Palestinian. In response, Geneina said his wife’s nationality will not be an obstacle to his candidacy in the 2018 elections, confirming his intentions. Local media is promoting the 2018 elections as an open arena for all political figures … except those affiliated to the Brotherhood group or other Islamist currents. Many politicians who have hinted at their participating are said to be wary of clearly stating their intentions, for fear that pro-government media will launch defamation campaigns. 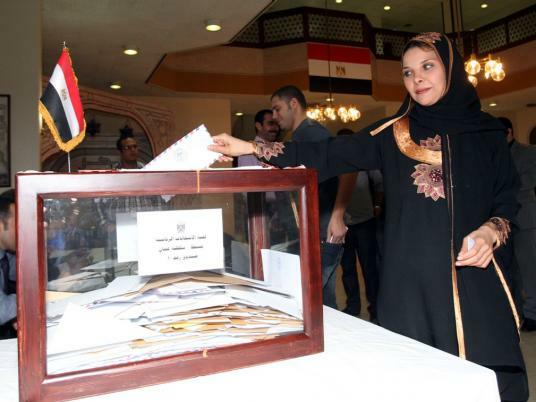 Egypt’s first presidential elections were in 2005, during the era of former president Hosni Mubarak. The second were in 2012, in the wake of the Arab Spring, which saw Mohamed Morsi of the Muslim Brotherhood elected. After the military-backed popular coup which ousted Morsi and banned the Islamist group, the most recent elections were held in 2014 between Sisi and Sabahy. Before this, Egyptians would choose their president by popular referendum on a sole candidate.